You are here: Virgin Islands News Online » News » PHOTO of the Day: Blocked Ghut in Road Town: Are we in hurricane season? PHOTO of the Day: Blocked Ghut in Road Town: Are we in hurricane season? ROAD TOWN, Tortola, VI - Our roving camera was shocked to see a main ghut, in the Capital City, Road Town—adjacent to MoneyGram and the Fire and Rescue Station—blocked with heavy debris. The matter was brought to our attention by a resident living in Road Town. The ghut, if not cleared will cause flooding and overflow its banks. This represents a concerning situation for many businesses and residents in the middle of the Hurricane season. The member that represents the Capital is Hon Mark H. Vanterpool (R4) who also happens to be the Minister for Communications and Works. SMH what can you expect? Please Mr. Minister of the 4th District....please clean up the debris. That area is prone to flooding. We are in the middle of hurricane season and plenty more rain on the way. Save our little town....please. Is this fake news? This is gross negligence. 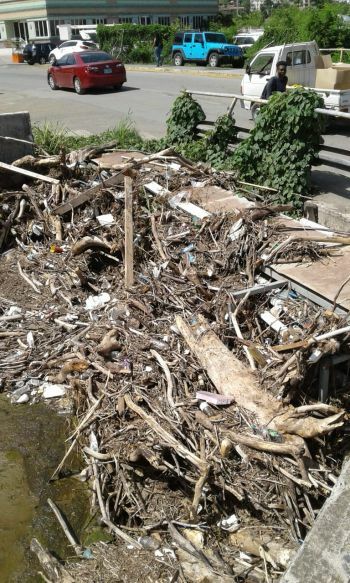 There is no doubt that blocked ghuts cause flooding of homes, schools, medical clinics, roads, businesses.....etc yet in the middle of Road Town, the capital city, seat of government, finance, business and recreational center........etc is a ghut full with debris. With the next rain, no doubt the area in the vicinity of this ghut will flood. The excuse that we may hear is that the debris came from the recent rains. True, yet a lame excuse and BS. PWD, mobilized crews and clean the damn ghut now, tonite. Enough of the gross negligence already. Excavator and dump trucks would be there by the end of the week. I promise. A well-designed and constructed drainage system that is poorly maintained will result in flooding. The drainage system should have a maintenance plan; the system should be continuously inspected and maintained periodically, ie, monthly, quarterly or more frequently as needed. Flood-prone areas should be inspected and maintained more frequently; they should be inspected and maintained as needed with the 1) forecast of heavy rainfall and 2)after a heavy rainfall. Ghut maintenance should be a line item in PWD annual Operations & Maintenance budget. Furthermore, PWD should have a dedicated drainage section. Moreover, the debris in the picture look as if it was recently pickup by drainage flow upstream and transported down stream to its current position that is blocking flow that can contribute to flooding. As noted above, it should be a standard operating procedure (SOP) to inspect ghuts immediately after a heavy and prolonged rain event and ghuts cleaned as needed. This SOP should received increased priority during hurricane season that runs from 01 June to 30 November. 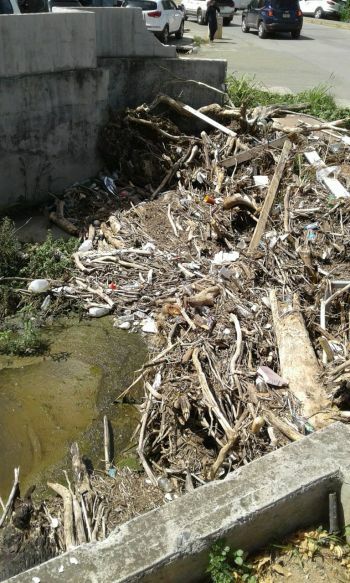 The MCW/PWD should remove the debris in the ghut immediately. A Town lady who hardly speaks to persons around town. Not a people person. Good luck! CHECK ALL THE GUTS.. I SEE THE ONE BY GOLDEN HIND/TICO ALSO BLOCK AFTER THE BRIDGE, STILL GOT ROOF PANELS IN IT!! .....i blame the people of the district who have access to time and resources to take matters into their own hands and secure the well-being of their establishments and families. Instead of bitching to representatives we all know deserve nothing short of a hanging, we need to put our feet down and build a better community and future. How many more children or even failies must suffer at the hands of out of touch representatives? Come on....wipe yall own backside and pull yall damn pants up. Road Town isn't a city. It's barely a town.